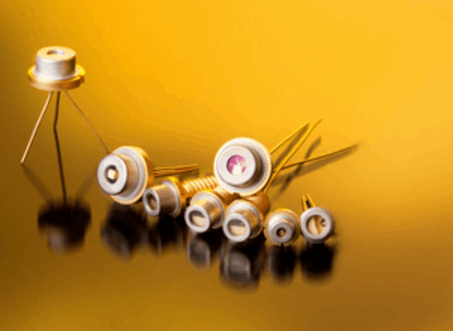 LASER COMPONENTS designs and produces high power pulsed laser diodes (PLDs) at 905 nm with high reliability, and high temperature stability. Applications for these laser diodes include range finding, speed monitoring, laser radars, security scanners, and laser light curtains, as well as in test and measurement systems. The 905 nm PLDs are manufactured in a TO-18, 5.6 mm, 9 mm, or 8-32 coax housing, or as a chip on a ceramic sub mount. They are available as single elements of stacks with peak power up to 650 W. The single elements are designed to achieve a peak power efficiency of 1 W/A, and the stack designs can reach an output of up to 650 W at a pulse length of 150 ns and a duty cycle of 0.1 percent. Download the individual datasheets and catalog for more information on the different available series of 905 nm pulsed laser diodes.